I, Robot (1950) is a collection of a short stories by Isaac Asimov, linked by an interview between a reporter an robopsychologist Susan Calvin about her work with dysfunctional robots and problems with human-robot interactions. It is in these stories that Asimov took the fundamental step of treating robots as aware entities with their own set of programmed ethics - the Three Laws of Robotics - rather than Frankenstein's monster creations of mad scientist. The laws are: 1)A robot may not injure a human being, or, through inaction, allow a human being to come to harm. 2) A robot must obey the orders given to it by human beings except where such orders would conflict with the First Law. 3) A robot must protect its own existence as long as such protection does not conflict with the First or Second Law of Robotics. 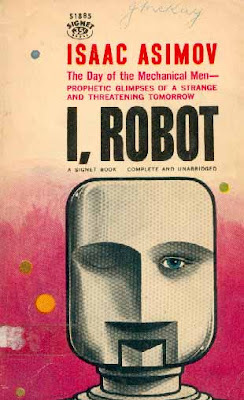 Asimov deliberately left loopholes in the laws, and each of the stories is a detective story in which Calvin or her colleagues at U.S. Robotics and Mechanical Men Inc., Martin and Donovan, discover which ambiguity or conflict between the laws is causing the robot to behave in an unexpected way. The stories are arranged chronologically with the development of positronic robots. The first robot to appear is Robbie, the perfect playmate for young girl, who because of him becomes isolated from other children. Other robots include Nestor 10, whose programming conflict can only be solved by adjusting the First Law for him so that he can allow his employers to put themselves at risk in order to do their work. 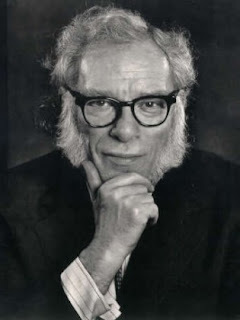 Asimov's Three Laws have spread throughout science fiction and almost every robot in books or on screen is created with the assumption that these laws govern its behaviour. In the first story, “Robbie” a charming robot is introduced into a family as little Gloria’s playmate and caretaker, much against her mother’s wishes. Prejudiced against robots, she eventually succeeds in sending Robbie away. When Gloria is told the machine will not be returning, she screams, “He was not no machine! He was a person just like you and me and he was my friend”. When her father engineers a chance for Robbie and Gloria to meet again, an errant tractor threatens to mow her down and Robbie saves the little girl’s life. As a result, Robbie is welcomed back into the household—the unconditional power of the First Law of Robotics now proven. “Runaround” the second story explores how the Second and Third Laws of Robotics can conflict. Speedy’s attempt to adhere to both laws despite their conflicting nature gives the phrase, “mechanical application of the law,” a whole new meaning. An unflappable pair of characters, Gregory Powell and Mike Donovan, whose job it is to test new robots and troubleshoot problems, finally resolve the conflict by using the First Law to dislodge the robot from its dilemma. Powell and Donovan return in the next story, “Reason”, to confront Cutie, a robot that blindly follows logic that leads to the conclusion that his existence must be the result of the Master rather than the work of inferior human beings. Powell assesses the problem this way: “He’s a reasoning robot—damn it. He believes only reason, and there’s one trouble with that…You can prove anything you want by coldly logical reason—if you pick the proper postulates”. There are two other intriguing developments in this story: that the two humans conclude that it isn’t what Cutie believes that matters but what he actually does, and the introduction of another law: robots are no longer allowed on Earth. Is this latter development the result of rational policy or irrational prejudice or fear? The fourth story, “Catch That Rabbit”, takes place on an asteroid. Powell and Donovan are frustrated with the abnormal behavior of Dave, a multiple robot with six robot fingers. It is only when they use the power of deduction that they uncover why Dave fails to follow orders when he is left unsupervised. The fifth story “Liar!” is told in the first person by Susan Calvin. She shares her painful memory of when she trusted a robot to tell her the truth about a love interest, and the robot lied in order to avoid hurting her feelings since this would violate the First Law. The First Law is also central to the sixth story, “Little Lost Robot”. Nestor 10 is an experimental unit that has been imprinted with a modified First Law that reads only: “No robot may harm a human being.” As a result, Nestor 10 has “no compulsion to prevent one coming to harm through an extraneous agency such as gamma rays”. When Nestor 10 becomes lost among 62 other robots, it renders them all untrustworthy. How then to trick Nestor 10 to reveal itself? In the seventh story, “Escape!” Dr. Calvin carefully inputs into a thinking machine called “The Brain” a dilemma that had caused a competitor’s machine to crack. As a way of coping with the tension, The Brain develops a sense of humor and becomes a practical joker—with deadly results.